I rummaged through my pantry and came up with these wicked witch components...broomsticks (pretzel sticks), noses (candy corn), fingernails (chocolate-covered sunflower seeds), warts (green sixlets), and of course, wicked witch hats (original Bugles and black candy melts). I added some melted purple candy melts to popcorn to bring it all together, and there you have it! 1. Make stovetop popcorn: I used a 4 quart pan, covered the bottom of pan with vegetable oil (about 2 tablespoons) and then filled the bottom of the pan with a layer of popcorn. Cook over medium heat, moving pan back and forth (so as not to burn it) over burner, until all popcorn is popped. Of course you may use microwave popcorn if you prefer. 2. Line two baking sheets with wax paper. Spread popped popcorn onto the two sheets. 3. Melt a bag of purple candy melts (I used Wilton) and drizzle over the popcorn. Mix well. 4. Add all the other add-ins, and mix. 1. Line up about 3 dozen original Bugle snacks on wax paper. 2. Melt a package of black candy melts in a deep bowl. 3. Using a fork, dip each bugle in the black melted candy. Gently tap off excess and stand up on wax paper to dry. 5. Place some black melted candy in a decorating bag or a plastic squirt bottle. 6. On a piece of wax paper, make black round circles about the size of a quarter. While still wet, place the dry, top part of the hat onto the middle of the wet, black disc. Let them dry completely. 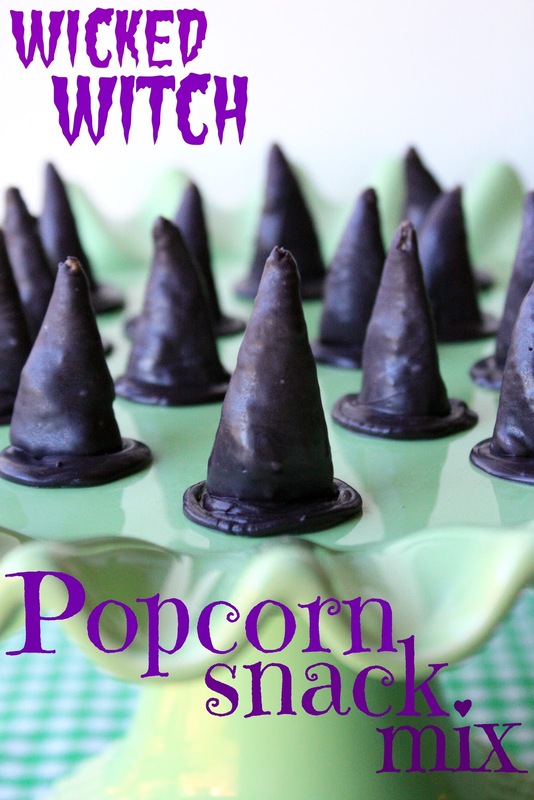 The witch hats are the cutest and what a clever idea to make up this popcorn snack mix. These are the cutest little warts ever!! YUM, I would sure enjoy munching on this snack mix!! What a fun snack! My son would love this. What a clever idea to use the the bugles for hats! I love your bugle snack mixes. This one is so cute. this is the bestest idea ever - I would just love to see what my hands would look like dipping those bugels into black candy coating! FUN! Great fun. I love snack mixes... these are too perfect for Halloween! Oh my goodness, those witch hats are too adorable. LOVE them! What a great party snack for Halloween! A little lucky dip. It would be fun to build your own witch cookie with the accessories! I love popcorn and I love purple, what a great combination. This is a great snack for when I take a break to watch some episodes of 'Bewitched'. Thanks!